Featuring works from photographers from the early 20th century to present day, Flora will be on view July 16 – October 23, 2011 at the Akron Art Museum in the Fred and Laura Ruth Bidwell Gallery. Flora includes the Akron debut of recent acquisitions by artists including Imogen Cunningham, Martha Madigan and Northeast Ohio artists Douglas Lucak, Judith McMillan, J. Dwight Palmer, P.J. Rogers and Stephen Tomasko. Flowers have proven to be irresistible subjects for painters and sculptors through the ages and, from the early days of photography, for photographers. This exhibition, drawn entirely from the collection of the Akron Art Museum, surveys different approaches photographers have used to depict the plant world. Imogen Cunningham’s extreme close-up view, Magnolia Blossom, Tower of Jewels, 1925, is one of the artist’s signature images. 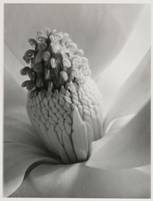 Part of an extended study she made of magnolias between 1923 and 1925, the photograph was produced for her own pleasure. As personal work, it was relegated to spare moments between sittings for portrait commissions and the duties of raising her three sons. Flowers for Elizabeth, created by André Kertesz at the age of 82, is a seemingly casual glimpse of the domestic life of the artist. The image is a carefully composed paean to the romance and affection still alive in Kertesz’s four decade-long marriage. This exhibition is organized by the Akron Art Museum and made possible by generous support from the Weisberger Family. This entry was posted in akron, Art News, arts, galleries, museums, ohio, photography, shows and tagged akron, akron art museum, art news, exhibit, exhibition, gallery, museum, ohio. Bookmark the permalink.